I thought the organized tours were overpriced, but assumed that Americans, the majority of passengers, did not agree with me, as the desks for booking tours were always busy. I am not so naïve to think all Americans are wealthy but they do have a higher standard of living than Israelis. Getting onto the bus going into Ravenna, I overheard fellow passengers, Americans, discussing the cost of sightseeing. One of the tours that same day was to Bologna, the home of spaghetti with meat sauce and cheese. “Why didn’t you take the tour today?” one lady asked another. “Yeh, it’s boloney,” came the repartee. As a true Israeli kibitzer, I wanted to applaud her quick humor, but I managed just in time to reign in my enthusiasm. I looked up the cost of that trip when I got back to the cabin to confirm what I had overheard, U.S. $ 174 per person, that’s U.S. $ 348! The town of Ravenna was similar to Livorno or Salerno, but reinforced my positive feelings about smaller Italian cities, with clean streets, well-kept buildings, with residents always helpful to strangers and, of course, let me not forget, the chic women. On being dropped off in the town, we were as usual given a map that always showed the meeting place. I was on my own, Jill not being as interested in art as I am, decided to take it easy and stay on the ship. As a couple we do almost everything together, especially since we both don’t work. As strange as it sounds, on the very few occasions we take ‘time out’ from each other, if only for a few hours, our relationship, even after forty years feels re-invigorated. Map in hand, I set off for the Mausoleum of Galla Placida and the Basilica of San Vitale, passing Piazza del Popolo, where there was a tourist fair on. The Piazza is rectangular with attractive shops and restaurants set within the arches of the buildings, which are a range of ochre hues, from dark orange to yellow, well preserved and spotlessly clean. There was tempting produce on sale, dried fruit, nuts and the ubiquitous meats and cheeses, but I didn’t buy. However the main emphasis of the fair was on the different regions of Italy for internal tourism, which hopefully for the Italians, is less expensive than Israel for Israelis. Preserving my energy, after my recent bout of ill health, I meandered towards my goal, asking directions from as many locals as possible. Although I look for younger people, who are more likely to understand English, in these days of the World Wide Web, I was faced with the predicament that I was in doubt about the direction and only a man of about my own age was in the vicinity. He was neatly dressed in a light brown suit, with a shirt and tie, carrying a slightly worn, old-fashioned dark leather briefcase, similar to one I ‘inherited’ from my father. “What language do you speak?” He retorted in perfect English, laying fallacy to my ‘younger people’ theory. He indicated the direction in a few words and I continued on my way. Across the street from the Basilica and Mausoleum stands a church, St Maria Maggoire, built as far as I could make out from the sign outside in 1699. Later reference told me it was rebuilt from earlier ruins. I decide to make a short detour, went in and walked around looking at the art and sculptures, which were unsophisticated by comparison to its very illustrious neighbors, but beautiful in their simplicity. I was alone and the tranquility was calming, unknowingly preparing me to face the crowds and hubbub at my destination. On reaching my goal, I stood in line with many other visitors, mainly Americans, to buy tickets. It is said that only ten per cent of Americans own passports, but thirty million travelers spending so many dollars, is one of the reasons the world is still very keen to keep the dollar ‘almighty’. I first visited the Basilica of San Vitale, which is not very spacious, but its very high ceilings are decorated in the area near the altar with the most amazing mosaics. It has been written that Michelangelo lay on his back painting the Sistine Chapel, but these artists are unknown and unsung heroes of medieval art. Working so high up in bad lighting, sticking little bits of coloured stone and perhaps glass, side by side, achieving such beauty was a technological achievement in that time. Considering the virulent anti-Semitism of the Church, I always wonder why so much of the art depicts the Old Testament, like Abraham sacrificing Isaac, and not more emphasis was put on Jesus. I stayed in the Basilica for some time, quietly, away from the masses viewing the mosaics, absorbing the feeling of antiquity that surrounded me. I thought of and felt at one with all the many who had been in the building seeking spirituality, even though I was in a church. I am by no means observant of even most fundamental of the mitzvoth, but closeness to the divine is personal and any holy sanctuary can be inspirational. The majority, like myself, who pass through today, are merely sightseers, pursuing only personal pleasure, not personal improvement, but unexpectedly I felt serenity within those ancient walls. 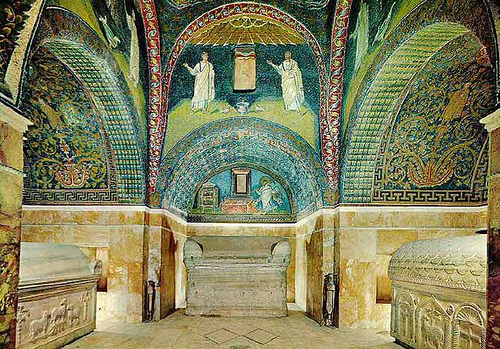 The Mausoleum of Galla Placida is a very small, cruciform room, entirely decorated with brilliant mosaics. I could have stayed for hours lying on the floor, if I was physically capable, staring at the ceiling, but a sign explains to visitors that the climate is controlled for humidity and temperature and requests a stay of no more than ten minutes per person. I reluctantly did as asked. By now I was tired and decided to make my way back indirectly - doing some more informal sightseeing around the delightful town - to the meeting point and back to the ship for lunch and a well-earned shlof. Next morning we arrived outside the town of Dubrovnik on the Adriatic coast. An announcement had been made that due to congestion in the harbor we would not dock, but go ashore on lighters, although later in the day normal service would be restored. We boarded a tourist pleasure craft, used, I presumed, to take sightseers along the verdant hilly shoreline and islands towards Split on the coast 160 km. to the north. A bus, provided by the city, took us to the center and dropped us off just outside the Old Town among a myriad of buses and crowds larger than those in Venice. The ubiquitous money exchange, restaurant and souvenir shop all appearing to be one business, was uniquely placed to trap all the monies of multiple nationalities. The currency is the Croatian Kuna, but Euros are accepted. The Americans, as always, traveled with dollars and were forced to convert. I don’t know why, because credit cards are more efficient. The local merchants may have taken advantage by inflating prices, which were in Euros as well as the local currency. The Old Town Walls, built from early as 14th century and in the 15th and 16th centuries are Jerusalem Old City by the sea, giving us a familiar feeling of being more in the Middle East, having been at one time part of the Byzantine Empire, than in Europe. The many visitors are guided into the Old Town by ropes which separates incoming from outgoing. We looked into the old pharmacy, the oldest in the world, originally operated by monks. As pharmacists we were disappointed that the fixtures and fittings, including bottles and ointment jars, looked no older than those of the Jerusalem pharmacy we owned in the 1980’s. The shop was packed with tourists but for me the place had lost any flavor of antiquity by the obvious need for utility and commercialism. The souvenirs were tat, not worthy of our attention. Thinking of Andrea and Alison, our two daughters back home we are always on the lookout for a feminine token or two to give them. Our son, David, in London, loses out big time, but that is the penalty for being a man. Unexpectedly we came across a shop selling the most ornate candles. We bought one for each of the girls at about six Euros. I looked again at the little black and white map we had been given on the bus and noticed the word ‘synagogue’ in not very bold print. My regular readers will know that I made a beeline for this historical Jewish site, which sadly is no more than a reminder of the small but once vibrant community who once inhabited the town, most of whom were transported and murdered during the Shoah. It was a Saturday morning, Shabbat, but a young man sat at the bottom of the staircase taking an admission fee to the shul, how sad! There are apparently thirty Jews living today in Dubrovnik, but where they were this Shabbat morning I did not find out. A short tour of the anterooms of the shul is interesting with displays of ketubot and other artifacts. The shul is beautiful in its simplicity. I felt sad and haunted by the ghosts of the past. Perhaps because of the fee I had paid, I also felt an emptiness and loss. An Australian lady, who was not Jewish as I had at first I thought, asked me many questions about the shul and the Jews and Judaism. I answered her with as much of the details as I could, keeping it simple. At one point I mentioned something about Holocaust denial, she responded sympathetically saying, “The proof is all here.” All who are witness to that tragedy and can deny the deniers are allies in the fight. The streets were crowded, and almost every three steps, tables, laid with different linen and crockery, indicated another restaurant. On the main thoroughfares and up the steps towards the alleyways, accommodation was waiting for hungry and thirsty visitors. A bottle of water in a mini-market was a little less expensive than that purchased in Venice. Another shop caught my eye, that of Michal Negrin, an Israeli designer of clothes and objet d’art. We Israelis are everywhere. The modern town outside of the ancient walls is very green and hilly, with winding roads, reminding me of the ascent towards Tsfat from the Lower Galilee. Supermarkets, banks, gas stations and other businesses abound, giving a prosperous look to the once recently war-torn area with not a few real estate agencies, enticing foreign investors. We left Dubrovnik later that afternoon on the final two days of our cruise, which were to be spent at sea. The shop on board had a clearance sale of most of their stock, a practice which I don’t understand as they turn around immediately the same day we disembarked with another 2,000 passengers. Why the supposed low prices? Maybe it’s just a ruse? On sale were jewelry, watches, perfumes, T-shirts with company logos, models of the ship is several sizes, and many other items, some useful others not, which could be purchased as mementos. Jill, who does all our shopping - that’s why men get married is it not - found some suitable gifts. For our daughters, some decorative earrings and necklace, for me a couple of T-shirts, and a wallet each for our son David, and his partner of two years, Christoff, who we would be meeting for the first time on the last leg of our holiday in London, and another for our new son-in-law, Sivan, at home. I don’t remember her buying anything for herself, thrifty as usual, keeping the Tobias fortune intact. The time sailing back to Barcelona was filled with eating, afternoon naps, trivia and various other entertainments. The last act of the cruise was an acrobat, who gave a very interesting lecture on the history of circus acrobatics and also a workshop on juggling and plate spinning, with the help of his very attractive wife and assistant. I joined in, but the actions needed to juggle made my head spin and I had to desist. Needless to say for those who wanted to participate there was no time to be bored. The ship came out of the Straits of Messina and sailed south of Sardinia. There was a daily map, but having faith in the captain who had managed so far, I didn’t actually take note, and let him get on with it. The night before our arrival back in Barcelona, we were asked to attach numbered labels to our luggage and leave them in the corridor. When we awoke the next morning all the suitcases had disappeared. We ate breakfast, checked that we had not forgotten anything in our cabin, gathered our hand luggage and made for the lounge assigned to us pre-disembarkation, which was to be at 9.00. About fifteen minutes early we were given the go ahead to leave. Entering the same hall used to embark, we easily found our luggage, went outside where stewards helped us to one of the many taxis, and within about twenty minutes had arrived at our Barcelona hotel. Only one reminder of our cruise is still with me. My middle-aged paunch increased so markedly that I named it ‘Brilliance of the Seas’. I am trying, hopefully not in vain, to rid myself of this unwanted vestige.